Ah, spinners. The newest toy designed to drive teachers mad. Pokemon, hackey sacks, digipets, it’s an age-old problem for teachers. The hot toy of the day makes it into the classroom. Schools quickly ban the toy and kids create a black market to sneak it in. Why fight it? Embrace it! Invite those spinners into class as a learning tool! Review friction– students find different surfaces around the classroom to spin their spinner. Use timers or cell phones to time how long the spinner spins on various surfaces. Students can then enter their data in Google sheets, and even use the “insert chart” feature to make a line graph of their data. Write a persuasive letter– students hate being told, “You’re not allowed”. Have students write a persuasive letter to the powers that be, enumerating all the reasons they should be allowed to have spinners in class. Practice vocabulary– (use this sheet) ask students to make small squares labeled 1,2 & 3. Have students tape each number to an arm of the spinner. Choose some vocabulary words. Students then spin their spinner and stick out their pointer finger towards their spinner. Whichever arm stops closest to their pointer finger, is the action from the sheet they will use with their first vocabulary word. Students repeat this process for each vocabulary word. Practice spelling– students use the same labels from above. Students then spin the spinner, whichever number their pointer finger points to, their partner has to write spelling sentences with multiples of the number that was spun. If I spun a 3, my partner would have to write sentences for spelling words #3, 6, 9, 12, 15, & 18. If they spin a 1, the partner writes spelling sentences for #1-8. Then switch, and have the partner do the same. Multiplication practice– Are your students studying 1×1 digit multiplication, 2×2, or maybe 3x? Ask students to create three labels for their spinner. They can choose their own numbers, but they should correlate to the number of digits they are practicing. If you are studying 1×2 or 2×3, ask one partner to choose 2 digit numbers and the other partner to choose 3 digit numbers. Tape the labels to each arm of the spinner. Partners point at each other’s spinner. They take each number that they spun and pair them together to practice multiplication. Repeat. Division practice– students again choose their own labels for their spinner. Students can practice in small group, with one student making numbers for the divisor, and the rest making numbers for the divisor or quotient. Everyone spins at the same time. The group must use the divisor from the one student. That student may choose which dividend they want to use. Everyone uses the divisor to solve for the number they spun. Once they have gone through all their numbers, have them switch spinners clockwise. Revise & redesign– Ask students, “Where will a spinner not spin?” Can students redesign a spinner to spin better? Ask students to design a better spinner. Have them draw up plans, diagram it, and even create an advertisement. Then, put their plans into action. Provide basic supplies: Popsicle sticks, jewel cases, old CD’s, aluminum foil, brads, paper clips, etc. Allow students to create their design and demonstrate at a “Spin-off”. Fraction comparison– students label their spinner with three labels, this time fractions. Students tape their labels to their spinners. Students then go around the class, spinning their spinner and partnering up to compare their fractions. They choose a new partner for each spin. Students can even keep tally of the number of times their fraction was the largest. Random name generator– use word art to make a page with everyone’s name. Attach a paper arrow to one of the spinner’s arms. Then place the spinner in the center of the circle and spin. The class will love this new take on an old favorite. Reading with purpose– Find the history of the spinner here and its original purpose. Great article, but there are many ads. The article also mentions toys of the past. QR Codes Can Do More Than You Think! Find your match– Generate QR Codes to play any matching game. This could also be used for facts that are one-liners. Ex: Which part of the story is where the problem started? Cut the QR codes in half, with the answer on one side and the question on the other. When students find their match, they can scan the QR Code to see if they were right. A prompt will appear if they are correct. The great part, the QR Code says simple statements like, “Awesome” or “Good job!” Making the QR Codes reusable for other activities. Even better, Reimers created a template for this. You could use this activity for almost anything. Ideas for the little guys– Learning to read? Want those wiggly bodies to get up and move? Reimer has a number of ideas here to use QR Codes in the K-2 classroom. My favorite was a mix and match with a numeral on top and the word match on the bottom. When you scan the QR Code, you get a picture that shows that number in real life use (eight cookies, twelve eggs, 5 basketball players). Mapping- Geography comes alive when you add QR Codes. My World Cultures classes studied Africa through QR Codes. Credit given to Carole Pattison for creating these. I took blue tape and made a huge shape of Africa on the floor. In each region the students needed to study, a QR Code was taped to the floor under clear packing tape. Students were encouraged to discover Africa through these codes. Some were videos, some were interactive websites, and some were news stories of current events. Students took notes and made a S’more on the political, economic, geographic, or social aspects they found. After installing the Add-On, QR Code Generator, to your Google Sheets. Follow steps 1-6. For more marvelous resources, visit Reimers website for tons of ideas! 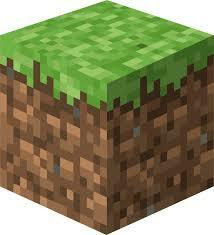 Minecraft is becoming very popular among educators. Teachers have begun to see the many possibilities Minecraft Edu (a version with teacher controls) has to offer. I recently won a grant to install Minecraft Edu on 24 computers at my school. As I begin to experiment with the possibilities of teaching and learning with Minecraft Edu in the classroom, I thought I would make some notes for those that might be considering a venture into the square side. Minecraft Edu lives on hard drive of your computer, but networks all the computers with a teacher computer. Teachers have controls that allow them to control the environment the students are in. This includes being able to freeze them, mute them, teleport them, gift them with items and enable/disable them from building. There are 3 types of worlds the teacher may choose from: Minecraft Edu, Creative, and Survival. I have only experimented with Minecraft Edu world option thus far, but I can see the benefits. My latest lesson involved third graders using Minecraft Edu world option to practice their area/perimeter skills. When students enter the world, they default to start with no inventory and there is nothing that can be found for students to add to their inventory. This would seem very limiting, so why is this option attractive? For my third graders, this was a great way for them to be introduced to Minecraft Edu. They were given a task, create a structure with a perimeter of 12. I gave them 20 Oak blocks. Just enough for them to make a few mistakes as they learn. I also gave them a sign to label the area and perimeter of their structure when done. By being able to control inventory in mathematical learning situations, you can help students to think about the reasonableness of their answers. It also stops most of them from being off task. If they needed more blocks, I made them present me with a valid argument as to why. Another great reason for students to not have an inventory- you can offer to give pieces of inventory as incentives for hard work. When students accomplished a task, or helped a neighbor, I gifted them with inventory pieces they desired, such as glass, gold ingot, doors, etc. Even students who have played Minecraft at home, have probably not played it on a computer. There will be a learning curve for most students. Make sure your first assignment is something that gives the student enough space to learn and be creative, without them worrying too much about their grade for the day. More adventures from learning with Minecraft coming soon. Can I Offer You an Appy Meal? Would you like to encourage your students to be adventurous with their use of technology? All while encouraging them to be explorers, risk- takers, and to nurture their creative talents? You can do all of this and still teach the standards you need. This is an “Appy Meal”. Teachers can create this to be a stand alone technology center or a whole class activity. Here is the box design and resources. See below for instructions on how to use the Appy Meal with your class. Explore: Use this page to find suggestions of “Apps” (this term is used throughout to include websites) students can use to explore topics. The teacher can cut these out and fill the Appy Meal with them when it is time to engage students in new learning or have them research for deeper understanding. These apps can also be substituted with your favorites. Create: Use this page to find suggestions of “Apps” students can use to create products. The teacher can cut these out and fill the Appy Meal with them when it is time for students to synthesize their learning by creating something new. 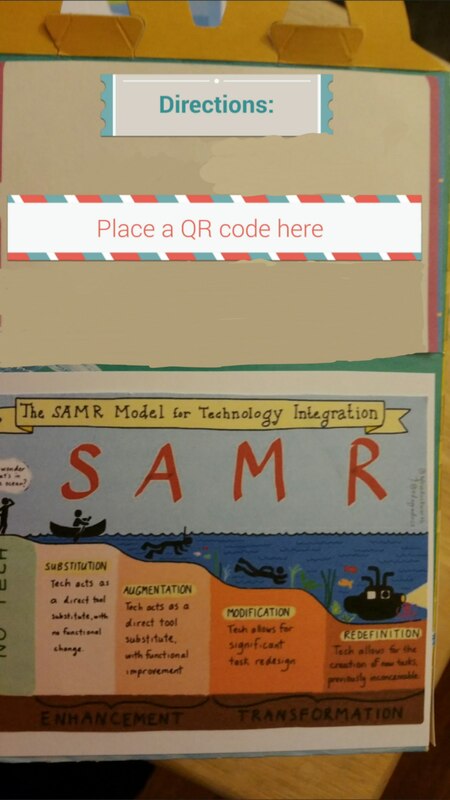 Resources: The SAMR image is thanks to Sylvia Duckworth. I made the Hello name tag on Canva.com, but you could use a real name tag. I suggest you use one side of the box to paste directions or a QR code that has directions recorded on a voice file that will play when students scan it. 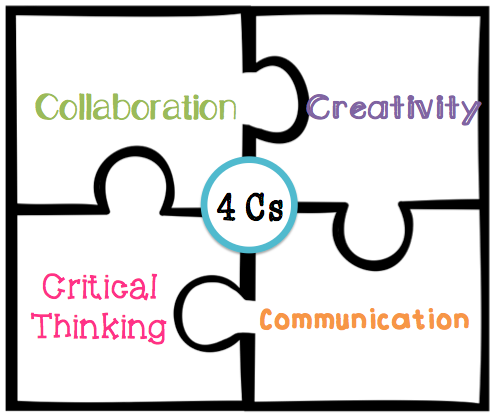 The 4 C’s image can be found here. Credit to http://runteacherrunriley.blogspot.com/ I added an old spinner from a game of Life to this image. You could also use a paperclip and a brad. *Author’s Note- For the use of this box, I would suggest the Critical Thinking piece be used for students to question something they’ve learned during exploring or edit their neighbor’s work while creating. The activity already calls for creativity, so on the Creativity piece, students can create a question to ask another student about what they learned. The teacher can choose to put the box in a learning center. 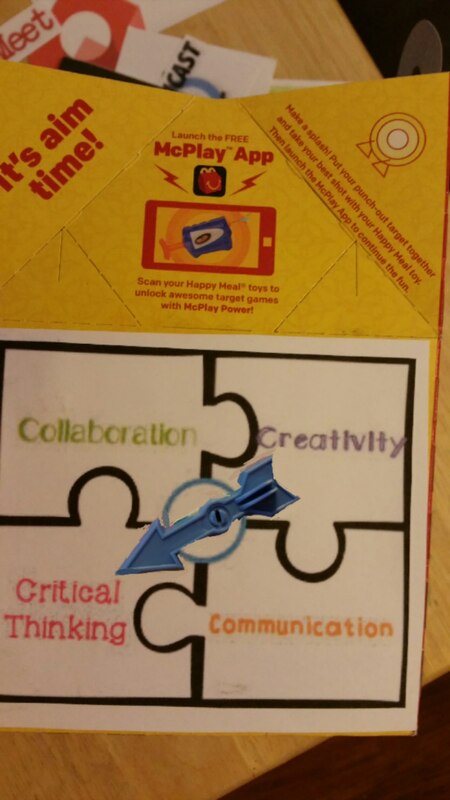 The teacher would decide if the apps inside the box are “Explore” apps to explore a topic they are learning about or “Create” apps to create a product about something they have already learned. There is a die in the box for students to decide who gets a turn to draw an app out of the box first. The student rolls the die and then draws an app out of the box. Students then spin the spinner on the “4 C’s” and make sure they incorporate one of the “C’s” into their center work. By each student having the additional challenge of trying to figure out a new app while still needing to achieve an objective, students are learning to become risk-takers in an environment that is supportive. Have 2 boxes (explore and create) in the center. Students draw from each and “smash” their apps together. When doing explore pieces, each group that comes to the center could add to the knowledge of the group before. This could be digitally or on paper. If creations are posted, students could list the positives and negatives of the app they used to aid others. The teacher decides to put either explore apps or create apps into the box. Then every student in the class chooses an app out of the box. Once everyone draws out of the box, all students will have different apps, but the same intent. For whole class, the teacher could choose one of the “4 C’s” for the whole class to do or each student could spin for a choice of one as they draw an app. Think of this like speed dating an app for one class period. 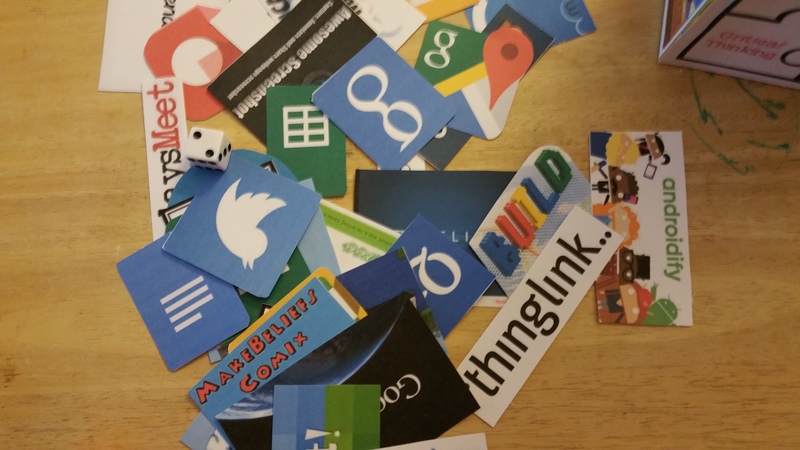 Have students stick with the app they chose, even if they dislike it. * The knowledge they gain from this experience can help themselves and others in the future, not to mention it builds tenacity. While exploring, students can add their gained knowledge to a class poster or shared document. Teachers can make the No Repeats rule if desired. Students can spend half the class exploring. Then the teacher can reload the box with create apps and students draw from the box again. Students spend the other half the class creating with the knowledge they gained exploring. SAMR Challenge: Once a student has created a product with their app, they pass their creation to the next student who is challenged to create a product on the same topic, but one level up on the SAMR model. If redefinition was originally reached, then the challenged student tries to reach redefinition with a different app. *Teachers should keep in mind the objective of the lesson when choosing the apps to put in the box so that the apps are related to the content when necessary. 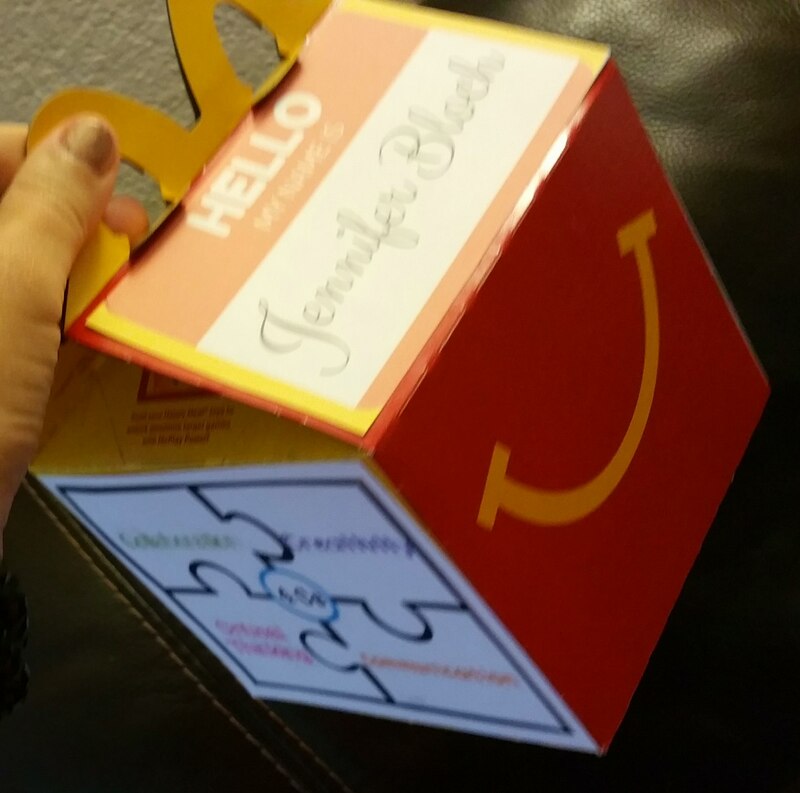 The Appy Meal was created to offer the classroom teacher an easy way to integrate technology without a lot of prior planning. There are many ways to adapt these ideas to fit your classroom. Feel free to email me your idea at 1hightechteacher@gmail.com. I would love to present this make and take technology PD to your staff. The Formula for Technology Integration in a School……. At one time in my career the pressure to use technology in my classroom made it feel like the walls were closing in on me. I knew this was the path education was taking. I knew that kids were interested in computers, but I honestly didn’t see the point. Every time I saw a student on a computer, they were playing a multiple choice game or learning multiplication facts. I can teach them deeper learning than that, I thought. The computer is just a vessel for rote memorization. Students were being babysat by a screen as they did little more than a digital worksheet with moving parts. Then, I moved to a new school. 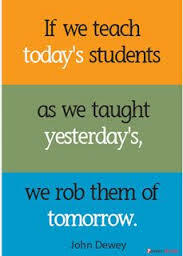 I thank the heavens for this change, as it was indeed a paradigm shift in my entire thought process as a teacher. It is by changing districts that I was able to learn a new mindset towards educational uses for technology. The differences were so stark between these districts, I realized that people really don’t know what they don’t know. Many education leaders claim they want their teachers to use technology, but they fault the wrong reasons as to why the teachers do not use technology. I wanted to lay out a formula for a successful model of what makes an environment for technology integration friendly to teachers. 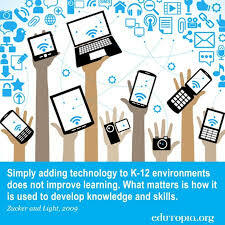 It is rarely because teachers do not wish to use technology. The teacher may know technology is important, but if the leader of the school does not express that they feel technology use is important in instruction and student learning, teachers are unlikely to become new adopters. Those that are late-adopters will feel no push toward adoption and those that are new adopters will be unsure of their footing when it comes to the woes of technology integration. Teachers must hear from their leader that technology integration is important, without high pressure sales tactics. Indeed, the best encouragement is by example. Leaders who teach PD with various new technologies are doing their staff a world of good by educating them on new technology as well as sending a message of favor. Almost every reason I had to NOT try technology had to do with my concerns about my job safety. When the technology fails for any of the millions of reasons that it assuredly will when I choose to use it with students, I know with out a doubt that will also be the exact moment one of my appraisers will walk in to do an observation of me. The teacher has to know that in this moment, the appraiser will compliment him/her for their valiant attempt, recognize their effort and gracefully bow out. The teacher also must know that they will not be persecuted when they become behind in the curriculum because of these types of incidents, or because the students have to be taught how to operate the computer/program before they can use it. If the leadership is truly on board with technology integration, they must be ready to support the teacher in their learning curve and the students in theirs. My fear of the above two incidents taking place paralyzed me and my classes into computer paralysis for many years. It was not until I met people who applauded and complimented others many classroom technological blunders that I decided I was in a safe environment. I can not over value the importance of having an IT dedicated to only your campus. A kind IT is worth a million dollars. I’ve had IT support that was knowledgeable and not kind, no one will go to that person for advice. If you have to make a choice between the best IT person to hire and the kindest, choose the kindest, they will reach more people. Lucky for me, I have both in one person. Leaders can force people to do things and people will hate every minute. Students can ask for things from teachers and they might be indulged. Teachers are most often moved to action by other teachers. Just like our students, it is our peer group that influences us in our ways. Google Plus is a great place to showcase ideas and ask questions in a safe space. Even better, those who are too shy to ask questions know who to email or ask in person because of what they see on G+. Having one person on each content or grade level team be the designated Techspert is always a good idea. Also, creating an atmosphere where teachers share one new technology idea a week in their meetings is usually something easy to accomplish. Find your most energetic, enigmatic teachers, and ask them to be loud and boisterous about their technology use. Have the teachers offer their most useful websites/apps for elective PD hours perhaps during lunch or after school. Only teachers know what is most useful to other teachers and can present it in a way that troubleshoots classroom problems no IT or career speaker can see. When student work is celebrated, teacher work is celebrated. There is a teacher behind each piece of student work that beams with pride. If students do digital work, have them share their work with another teacher of their choice, unsolicited from that teacher. This might be by hitting the “Share” button on Google Apps, it might be by emailing teachers a link to an online creation, it might be that the one teacher may have to email the other teacher for the student, as the student has no email. So when my class created a diagram using Lucid Chart in class about the 3 major religions of the Mid-East, students were offered the chance to send a “Share” message to any teacher in our school. This act has so many ripple effects, it is hard to name them all. Not only does the student have a new sense of pride for their work, they have a different audience. They also get to make a different educational connection with a teacher who doesn’t usually teach that subject. The teacher receives validation as a member of that student’s social circle and also possibly sees the student with a new skill set not usually presented in their class. The teacher also sees a piece of technology in action that he/she might then see as a viable option for their class. Display student work on the teacher’s website. Scroll it on the school’s website. Run it on the TVs in the cafeteria, front office, and everywhere else. Take that digital picture frame out of your closet and load it up with student work to show in your classroom. Do you have staff meetings that start with celebrations? While you are talking about all those personal staff celebrations, why not add some student tech celebrations to the mix? Show a few pre-loaded pieces of student digital work from around the school from the past week. Students get applause, teachers get celebrated for their hard work, new types of applications are noticed, and those whose mantra is constantly, ” we don’t have time for that,” see that some teachers are using technology to make wise use of their time. There is a place for rote memorization in education. To reach the top of the pyramid, you sometimes have to start at the bottom. There are MANY apps for that. The message and the emphasis should be on creation. When I originally saw technology in use, I only saw teachers using multiple choice programs, multiplication websites, and point and click interfaces. This led to my thought that technology could not teach deep thought. Since then I have changed schools. My new principal held the belief that the internet was for creating thought through synthesis of content taught. This indeed was an eye- opener to me! As I began to look around my new campus at what other teachers used to achieve this, I was freed into a rebirth of technology where the skills of blooms met the skills of an artist, inventor, map-maker, engineer, scientist, and so much more. This was what must be so great about the internet! After this revelation the world was my oyster and only the minutes in the school day were my enemy. My students were the beneficiaries of my new discoveries. So many teachers do not understand there is a distinction between these old out-dated point and click websites and the rich thinking that the art of creating something new can arouse. This is a distinction that actually has to be spelled out for teachers. 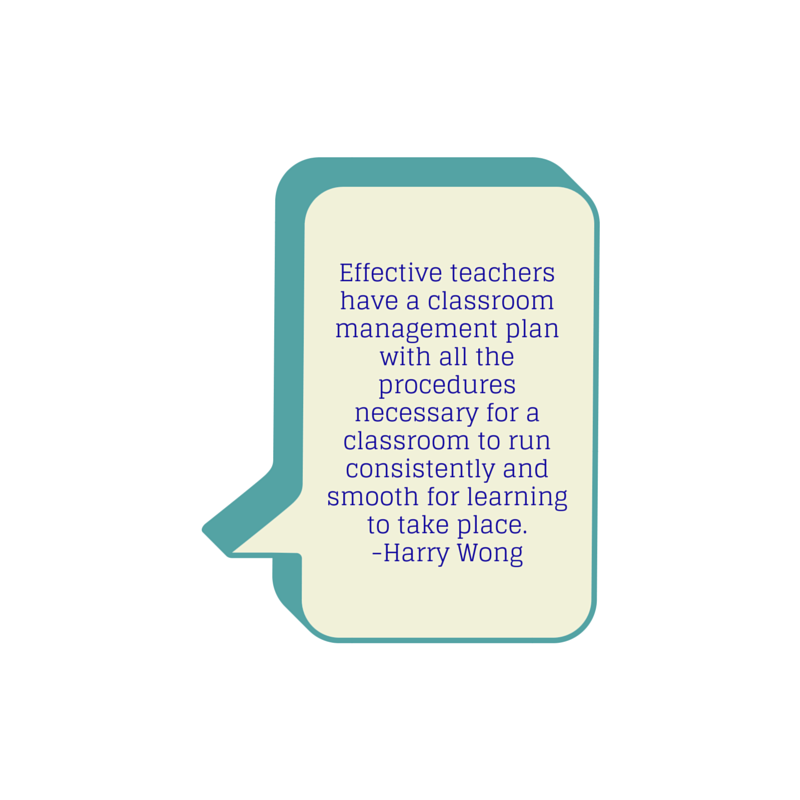 It may be an old, tired phrase, but PD is still one of the best ways to get teachers to use new tools. If you honestly think about your technology PD, how much time is actually dedicated to it? What message is sent by this? After the testing data is discussed, and the new system that just got adopted, the book study, the emergency procedures, the district goals, the PTA announcements, how much time is left for tech PD? And who teaches it, the IT person? Who determined this is what should be taught? Probably the district who just bought some new initiative. Grass roots efforts are best. Let teachers teach and let them be genuine in what is best for their peers. A message of support, an atmosphere of safety, collaboration, and celebration. These are the pieces to the technology integration puzzle in a school. Oh, yes, and time. Paradigm shift is a lengthy process that cannot be pushed, but instead must be pulled ever so gently in the right direction.